Reminiscent of harvest feasts and crisp autumnal days of yore, the classic candied apple has been around since the science of hard candies was applied to America’s favorite fruit at the turn of the twentieth century. Considering how countless bushels of candy-coated apples have been enjoyed since that revolutionary innovation, it’s surprising that little more has been done with the concept since then. For someone craving a more elegant presentation for cool weather holidays, it’s easy to take this sweet combination to a whole new level with this vegan candied apple flan. No more rock-hard candy shells to contend with nor messy sticks to eat off of! By gently stewing the apples into soft, creamy custard, the opportunity to add even more flavor into the mix opens up a world of possibilities. Keep this candied apple flan simple with a comforting pinch of cinnamon as suggested, or go bold with the full gamut of gingerbread spices to really pump up the heat. The typically tooth-cracking candy is now transformed into a lightly caramelized, syrupy topping, lending just the right amount of sweetness to the tart vegan apple crème beneath. 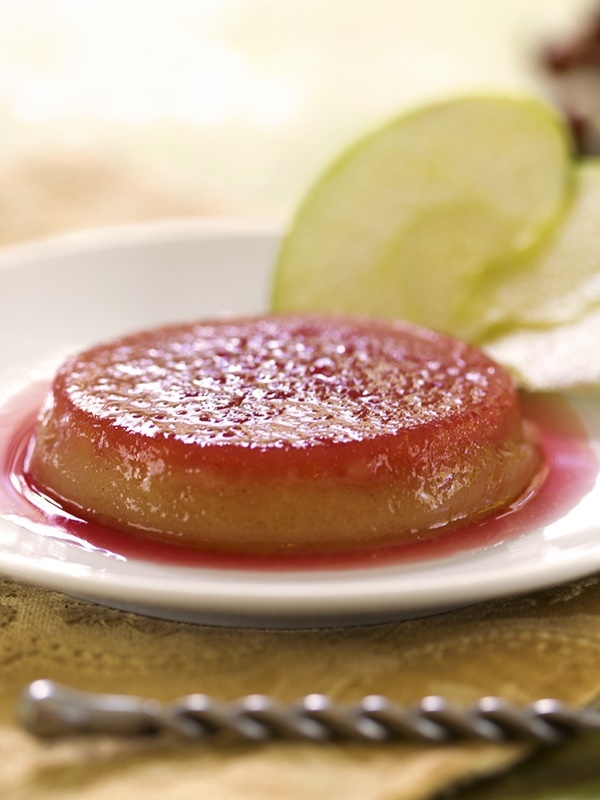 Though it looks quite fancy once plated, this comforting apple flan dessert is made entirely on the stovetop, unlike traditional flan that requires a fussy water bath and long baking time. One spoonful will convince even the staunchest traditionalists that it’s about time the candied apple was upgraded for modern tastes. By ingredients, this recipe is dairy-free / non-dairy, egg-free, gluten-free, grain-free, nut-free, peanut-free, soy-free, vegan / plant-based, vegetarian, and generally top food allergy-friendly. 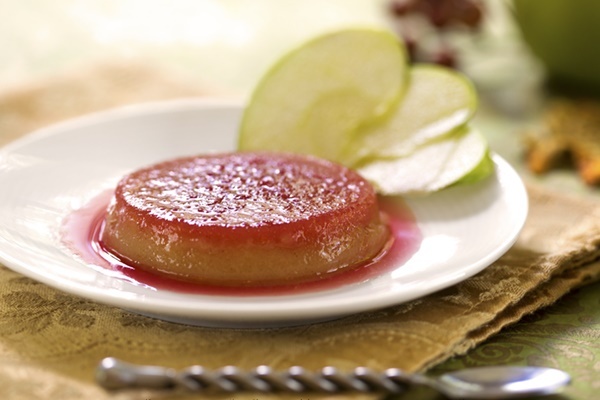 As usual, when making this apple flan, choose your ingredients wisely (like the milk alternative and margarine) for your free from needs and when cross-contamination is a concern. 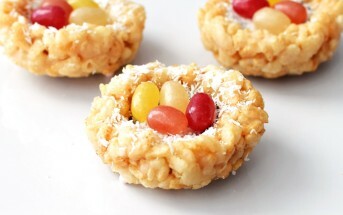 We’re sharing this recipe on Shirley’s Gluten-Free Wednesdays! Note that the prep time doesn't include cooling and chilling time. This is a great make ahead recipe! For the candy coating, place the sugar, beet juice or water, and agave in a medium sauce pan over low heat. Stir just until the sugar dissolves, and then keep that spatula far away from this mixture to prevent crystallization. 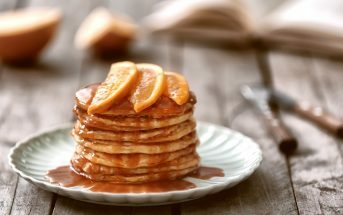 Increase the heat to medium-high and cook until the syrup turns a deep golden brown. Quickly remove from the heat and divide the hot caramel equally among 4 lightly greased ramekins. It won't look like very much, but just be sure to tilt each ramekin around so that the caramel completely covers the bottom. Let cool for at least 10 minutes. For the apple custard, place the milk alternative, diced apples, lemon juice, sugar, and cinnamon in a medium saucepan over medium heat and bring to a gentle simmer. Cook the apples until fork tender. Transfer the apple mixture into your blender. Thoroughly puree until completely smooth, and add in the cornstarch. Blend once more to fully incorporate the starch, scraping down the sides of the canister if needed. Return the liquid to the stove and whisk continuously, cooking for an additional 5 - 10 minutes, until the mixture has slightly thickened and small bubbles have begun to break on the surface. Whisk in the buttery spread or oil and vanilla. Equally divide the mixture between four 3-ounce ramekins, and tap them gently on the counter to smooth out the top. Let the custard cool to room temperature before moving the ramekins in to your refrigerator to chill for at least 3 hours. To serve, place a plate on top of one ramekin and quickly flip both over together. Remove the ramekin and unveil you candied apple creation!